I was introduced to quilting by two influential people in my life: my late sister and a famous quilter in Japan. My sister took a quilting class and said I should learn as well. My reply was that I could sew but quilting was beyond me. 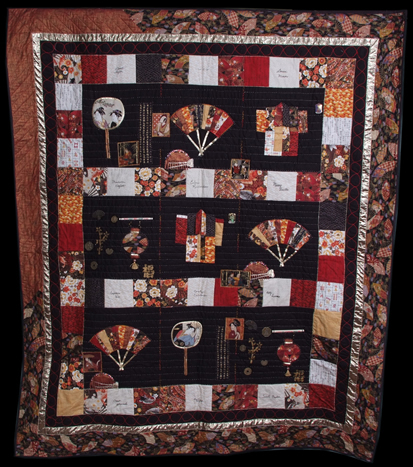 A Fulbright Fellowship to Sendai, Japan provided the venue for quilting. In this small town, I knew only the male law professors with whom I taught and the folks who lived in the international house complex. Life was going to be pretty lonely so I filled it with art. At the international house, I taught a few quilting classes for women from various parts of the world who wanted to learn how to quilt. It was through this effort that I was introduced to a famous quilter in a nearby area, Keiko Goke. Keiko became a dear friend. 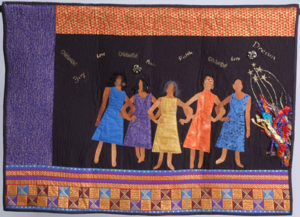 I quilted with Keiko and her quilting circle for the entire year of my fellowship and it was with her guidance that I was encouraged to “paint with fabric.” Keiko’s show at the end of my visit was my first quilt show. 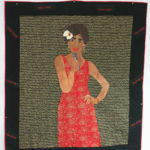 I returned home bitten by the quilt bug and produced my first art quilt that was shown at a Fulbright artist exhibit at the East West Center in Hawaii. My early art quilt influences were from Japan. It is not surprising because I experienced Japanese and Chinese culture as a child. It was fitting then that as an adult these might become part of my art. In Japan, I took many classes including calligraphy and painting. These became a part of my initial foray into art. While my career focused on law and raising children it was a chance meeting with Dr. Carolyn Mazloomi, the noted quilt historian, that caused me to return to quilting. Carolyn is focused on quilting. She encouraged me to make quilts. She also insisted that I decide whether I was going to be a hobby quilter or a quilt artist. It is she who pushed me to not only produce, but to produce quality. 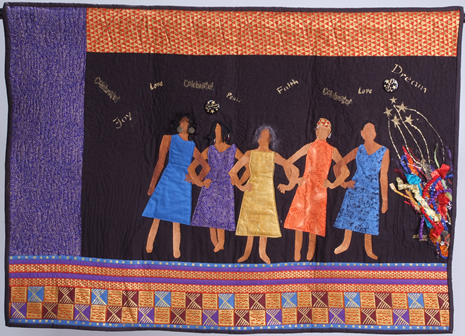 But the art of all of this I owe to Carolyn Crump, a talented sister who stretches quilts beyond their four corners. Carolyn Crump taught me to draw and to imagine more. I have her to thank for inspiring me to become an even better artist. When added to periodic trips to China, Ghana, South Africa and other countries I have truly had the opportunity to define and redefine my own style. Ever the student I can’t wait to see what else I can learn. 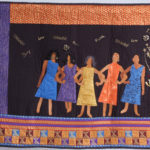 Art quilts are my trip through space, time, illusion, emotions, texture, and color. Ever practical, quilted place mats, throws, bedcovers, and wall hangings appeal to my lawyer’s notion of what is right and useful and my artist’s love of freedom and whimsy. Just in case Shakespeare was right in Henry the Sixth and someone follows up on killing all the lawyers, I thought I had better train for a new trade. My new trade is art quilting. There is something about a quilt. It tugs at your emotions. The textiles in it can be rough, smooth, nubby, slick or all of the above. 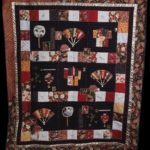 Quilts can be glamorous or calming or make you laugh. That is why I quilt. I love tapping into that something. Art quilts are my trip through space, time, illusion, emotions, texture, and color. Ever practical, quilted place mats, throws, bedcovers, and wall hangings appeal to my lawyer’s notion of what is right and useful and my artist’s love of freedom and whimsy. 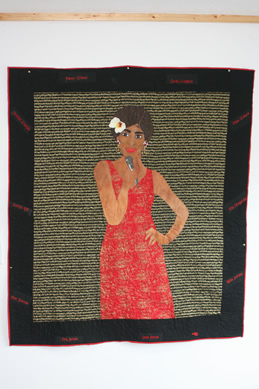 With the accuracy of patchwork, the discipline of appliqué, sewing, and cutting and the creativity of quilting, art quilts nurture my soul. While the journey for each quilt starts the same, serendipity creates wonderful surprises as my work progresses. I love fabrics from around the world. I love color, contrast, gold, and black. 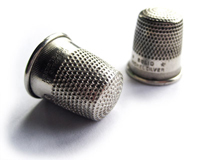 I use these to evoke emotion from my life and in the lives of my audience. For in the end, my work is simply a medium. It is my celebration and a summons to others to take their own evocative journey.